Play Phantasy Star online with Sega Master System browser emulation for free! 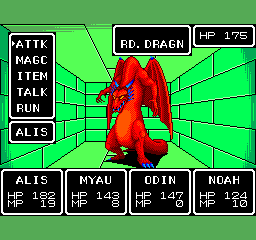 Phantasy Star (SMS) game rom is loaded with features in our flash, java and rgr plugin emulators. Nothing to configure, we've done it for you! Back when I was about to exchange my Sega Genesis for a Super Nintendo, I wanted to try older games I never tried. 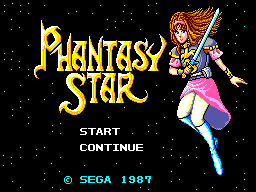 Since I liked Phantasy Star III and IV, I wanted to play Phantasy Star I but couldn't - I played II instead. But thanks to modern technology it's now possible to play it! Go back in time, in the Algol Star System, to the beginning of the greatest video game saga of all time - not even Final Fantasy could gather so much continuity. The graphics in this game are absolutely stunning for 8 bits. All four characters are very-well drawn and actually have human proportions instead of being blobs of pixels with oversized heads. Their clothes - especially Odin's - are very distinct and their flesh and hair are distinct too. 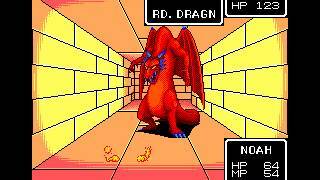 In games like Dragon Warrior, the characters' clothes and hair were usually the same color. 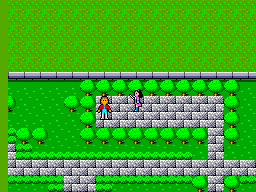 Towns and villages are rather small compared to FF, but villagers are much better-drawn. Plus, when you talk to then the screen changes and you see them in person, with their human-like proportions. Cities with spaceports (like Paseo and Camineet) are however much larger and even offer walking walkways (like the ones you find in airports). The world map on all three planets are very beautiful and detailed, and they reflect the planet's climate. Palma has a luscious green vegetation with many oceans - there are even boiling tar pits - while Motavia is a desert that has very little vegetation. Finally Dezolis is a planet of ice; ice walls will even block your way until you can get the Ice digger. Speaking of transportation, PS I doesn't feature airships or boats like traditional games. Instead, they feature state-of-the-art land transportation, including a land rover and a hydrofoil. You can also travel between planets using a spaceship. When you do, you will see a small movie that no FF game ever featured. 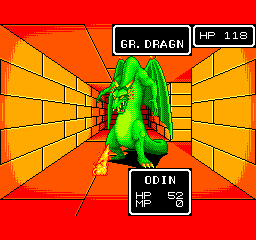 Dungeons are completely in 3D, which not many RPGs, even on 16-bits consoles, were able to do. The only real distinction is the color on the walls (blue, green, yellow and red) but the bricks are well-drawn. Finally, battles are a mixed bag. You can't see the characters at all (like DW), but you can see your weapon attacking monsters. Only FF III was able to match the realism of the weapons - Myau's claw shows the individual fingers scratching the enemy. Speaking of them, they actually move! It's not very elaborate - the swarms merely flap their wings, and Lashiec's staff throws bolts at you - but not even FF VI could get enemies to do more than flash. 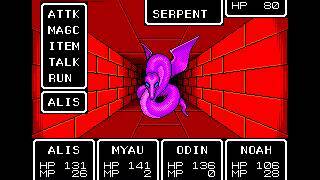 However, magic is much more limited than NES games and their animation is inferior to FF II and III. Slight caveat for the fights: enemies are grouped together. It's therefore impossible to choose which enemy you attack. But at least you can't miss since your attacks "roll over" to the next target when one is dead. For NES RPG fans, the music in PS I will be a deception. Don't get me wrong: the soundtrack is great. There is an overworld theme for each planet, reflecting the environment: Palma has a more epic theme, Motavia has a more "you have work to do to progress" feel while Dezolis is mysterious because the ice obstructs so much. The dungeon themes (3-4 of theme) are well-developed and addictive - two of them have even been remixed in PS IV. 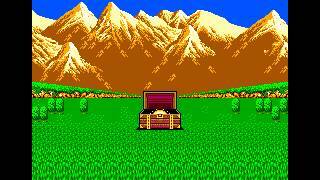 However, the town music is downright annoying and the village music isn't very interesting. Also, the ordinary battle theme is repetitive and there even isn't a boss battle - except for the last two monsters you confront, and those two sound pretty dramatic. 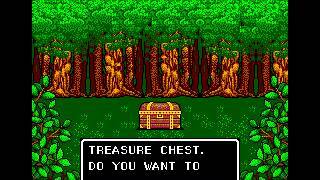 In short this doesn't carry the same epic feeling NES RPGs have. Also sound effects aren't very elaborate. 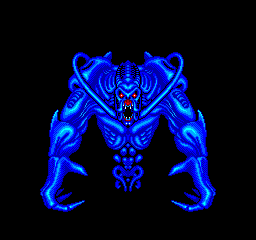 Most monsters make the same noise over and over again - even the final bosses don't sound much different. I admit being biased because I played the game in the 21st century, but I didn't find the game very addictive. Unlike FF games there is little to no humor. Characters in FF II were the best, and those in DW III and IV were very interesting. In PS, Alys, Odin, Myau and Lutz/Noah don't say much nor do they game good dialogues. It's just slightly better than FF I. Also, until you get the Land Cruiser walking on Motavia is very annoying because of the antlion. Even though you can easily defeat them there's no way around them. Finally the only real sidequest you have is looking for the Laconia weapons. You could technically finish the game without having them! Although the in-game story doesn't look very elaborate, the instruction manual shows the depth of the story. It's much superior to any 8-bits games, and even early 16-bits games. The time: Space Century 342. The place: the three planet Algol solar system located deep in the Andromeda galaxy. Under the democratic rule of King Lassic, life was good as he provided everything his people could want. Space Travel had been discovered 200 years before and deep space shuttles had allowed colonization of Motavia and Dezoris, the other worlds of the Algol Star System. But slowly, over time, things began to change. It started with a new religion which was rumored to have come from another galaxy. The dark priests of this religion, never seen by any mortal, promised immortality to all who joined. You would live forever! King Lassic was getting old. The idea of living forever appealed to him so he became the first to join. Then, he... changed. It started with the threatening suit of armor the priests made him. The armor looked evil and corrupt, and that's how Lassic began to rule his people. Outrageous taxes became a burden on everyone. Business on all three planets shut down and entire towns fell into decay. There was no way for the people to make any money. As time passed and the people suffered, horrible creatures and monsters began to stalk all three worlds. When the dead came back to life, the people feared the worst and guessed the truth. Trough black magic, Lassic had become an evil tyrant. But where there is evil there is always good. Brave individuals began to rally in secret against Lassic. But his Robotcops were ruthless in hunting out these defenders of the people. One was Nero, a spaceport worker in Camineet, the central town on Palma. Long ago, his father had disappeared trying to learn Lassic's evil secrets. Now, the Robotcops had crushed Nero as well. 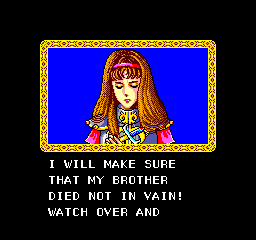 Before he died, he passed on his short sword and his quest to his sister, Alis. He also told her to find a brave fighter named Odin. Alis raised the sword to the sky and vowed that Nero's death would not go unavenged! So your ultimate goal is to defeat Lassic and to restore peace to the Algol Star system. Will you be able to rescue Odin? The story gets pretty elaborate. First, Odin himself has been turned to stone, so you need to find Myau, which carries a bottle of Ashline that turns stone to flesh. Once you get Odin, you hear about Lutz/Noah, a magician of great powers that might be able to help you. Once your team is complete you must find a way to discover Lassic's castle, which is hidden by the dark magic that corrupts him. In other words the whole game has a very coherent story, on par with games like FF III and DW III. Like so many early RPGs, PS is extremely difficult. In fact, it's so difficult that the speedrun of the game spends at least 10 percent level grinding because the final bosses are too difficult to beat otherwise. In addition, you can't even penetrate a dungeon unless you have something to light it up. Taking flashes all the time takes up precious space in your inventory, and the unlimited lighting item is quite expensive. Finally, EVERY monster you defeat will give you a treasure, and you never know when they will be trapped and potentially kill you from the damage. On the plus side though, you can see how many hit points every enemy but the final boss have. It's very practical against huge dragons to know when they're about to go down when YOU are about to. 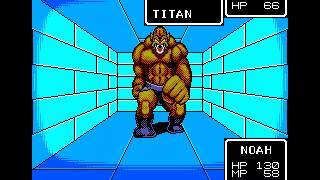 In short, Phantasy Star is a difficult game I'm not sure I can recommend. The graphics are beautiful and the story is awesome, but it's so difficult to get by - not as much as DW I though - that many players are likely to be discouraged quickly. The Sega Master System was clearly ahead of its time. It's unfortunate that the NES ruled the market. 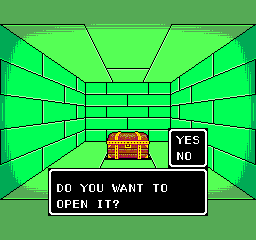 I don't think the NES would have been able to handle a quality POV perspective, like in the dungeons. Overall, a great game that deserves recognition. Technically superior to Final Fantasy, but the story flowed better in the latter. This game was actually remade, I believe. It's called Phantasy Star Online, or, PSO. Is there a way to make vizzed emu full screen? If I have downloaded the vizzed emu and have played and saved it on multiple time on a computer is it possible to load the saved game from another computer?